Hans Moleman can be seen on the FOX Network television show . Hans is a short feeble man with skin "like a peanut" and wears extremely thick eyeglasses. He states that he is 31 years old, but looks and acts more like 131. His luck is terribly bad, and he seems to die quite often...which is one of the points of this page...to keep a running count of how many times he has died! I ordinarily don't find humor in old men with bad luck, but then again, Hans is not an ordinary kind of guy. Come to think of it, he's not a guy at all...he's actually a cartoon...which, I believe, makes it ok for me to laugh at his misfortune. 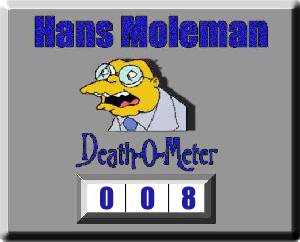 The Death-o-meter is designed to keep up with the number of times Hans has died on the show. While his deaths are not actually viewed, it can be assumed that death ensued. In other words, this number may be up for discussion...so feel free to discuss it! 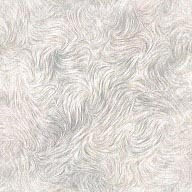 NOTE: All sound files are in WAV format and have been ZIPped to save space and download time. Also, due to the fact that I'm still creating this page, many sounds and picture files are not yet available. Here are some suggested deaths that may or may not be counted. I haven't decided yet, so they remain on this list for now. Feel free to share your thoughts...I'll let popular demand make the final call. Greedo suggests that Hans dies in Holloween Special (????) when the nuclear bomb hits Springfield. (I decided that I agree with this one even though we never actually see Hans, specifically). Lewis Boyd suggests that Hans may have died in (5F??) when Homer knocked him out in jail. Matt Johnson assumed that Hans starved to death in his pink Cadillac that crashed into the Planet Hype restaurant in (4F13). Springfield Elementary This is a new page that's off to a great start...definitely worth a look. A hearty Thanks! goes to my brother Dave for helping me dig through all of the episodes, looking for appearances of our friend, Hans. Thanks to Mike Smith for pointing out that I overlooked 3F06 and 3G02.